Reduce the time spent on your inbox. Feeling productive and actually being productive are two different things. In most cases, spending time on your inbox just makes you feel like you’re doing important things. Don’t give other companies permission to eat your time. Process emails during three set times per day. Set the time for this in your calendar. Use the four D’s: Do it, Delegate it, Defer it, or Delete it. Think twice before you forward, cc, or bcc. If you send fewer emails, you will receive fewer emails. 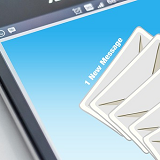 Use the subject line to communicate what actions you expect from the recipient. In this way, you help the recipient to process email faster. Keep emails short, really short. Show respect to the recipient by being brief.